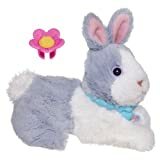 There’s nothing cuter than a baby rabbit, and this Busy Bunny pet is as cuddly and adorable as the real thing! When you stroke her furry back, she’ll move her paws and make fun sounds to show how much she likes you! Dress her up in her collar and ring for an even fancier look, or wear her collar on your own wrist as a bracelet. This fancy little pal will always be bunny-cute, and she’s all yours! FurReal Friends and all related characters are trademarks of Hasbro.